Officials of various departments conducted an inspection of the house -- Veda Nilayam. Chennai: The Tamil Nadu government today formally started the process to convert former chief minister J Jayalalithaa's Poes Garden residence, where she stayed for over three decades, into a memorial. The house was under a thick security cover after Chief Minister K Palaniswami announced in August that it would be converted into a memorial. "Today, we took the first step of inspecting the house of the former chief minister, including starting the formalities for acquiring the property," Chennai District Collector V Anbuselvan told reporters. Officials from the revenue, survey, public welfare departments, Income Tax (IT) department, besides the police took part in the inspection, he said. The total area of the property was also measured, Mr Anbuselvan added. Earlier, the investigation wing of the IT department had sealed two rooms of the house. These two rooms were not covered during today's inspection. "The Income Tax department had sealed two rooms. Therefore, before taking up today's inspection, the department was formally informed and their representatives were also present," the collector said. The IT sleuths had last month conducted searches at the office block of Veda Nilayam. The search had come days after the multi-city searches of 187 locations linked to 10 income tax assesse groups, including those linked to VK Sasikala, her kin and some associates. The Poes Garden residence was occupied by Jayalalithaa, along with her close aide Ms Sasikala, till her hospitalisation in September last year. The total area of the house is approximately 24,000 square feet. It was bought by Jayalalithaa and her mother in 1967. "Veda" is the name of Jayalalithaa's mother, who was known as Sandhya in the Tamil film world. Earlier this year, former chief minister O Panneerselvam, who had rebelled against Ms Sasikala, launched a signature campaign for converting Veda Nilayam into a memorial. 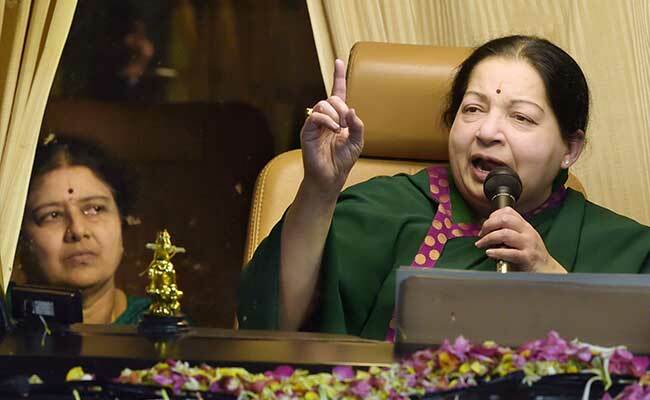 According to the affidavit filed by Jayalalithaa when she contested the polls from the RK Nagar Assembly constituency in 2016, the house was purchased on July 15, 1967 for Rs 1.32 lakh. The market value of the property was Rs 72.09 crore in 2016, the affidavit had said.